Liquor liability laws, also known as “dram shop” laws, are in place to hold bars, taverns, restaurants, and other organizations responsible for injuries sustained as a result of over-serving or intoxicated minors. Under these laws, injured persons can file a civil lawsuit against the person who caused the injury, as well as the establishment that sold him or her the liquor—as long as the plaintiff can prove that the bartender or server sold alcohol to someone who was visibly intoxicated. Bars and other drinking establishments are required to cut off a person who appears visibly intoxicated from drinking alcoholic beverages. A seller of alcoholic beverages—whether it be a bar, hotel, catering hall, or organization running a party—may be liable if a person who got drunk harms another person as a result of his or her intoxication (whether it involves a motor vehicle or otherwise). In addition, if the liquor sale involved a minor, the business who sold the liquor could be liable for damages suffered in an intoxicated assault or motor vehicle accident even if the minor was not visibly intoxicated at the time of purchase. MDL successfully settled a case in which a group of teenagers were admitted into a nightclub, served alcoholic beverages, and although one young man was visibly intoxicated, he was permitted to leave. He drove off and crashed into a tree at a high rate of speed and suffered brain damage and multiple fractures. MDL was able to establish that the nightclub had a habit of admitting underage patrons and serving them alcohol. The case settled at mediation at a very satisfactory amount under a confidentiality agreement. If you have suffered physical and financial harm due to an accident, assault, or other incident involving an intoxicated person, you may be able to sue under liquor liability laws in New Jersey. Contact Maggiano, DiGirolamo & Lizzi at (201) 585-9111 or fill out an online inquiry to schedule your free and confidential consultation today. How Does New Jersey Define Liquor Law Liability? A 2013 case involving T.G.I. Friday’s further refined New Jersey’s dram shop laws. In Halvorsen v. Villamil, et al., a man consumed alcohol at Friday’s, then drove home and collided with the back of a pickup truck, injuring a woman and her three children. After being transported to the hospital, the man showed a blood-alcohol concentration of 0.278 percent. Based on the man’s height, his weight, and the timeline of events, a toxicologist determined he must have been visibly intoxicated when he was served drinks at Friday’s. This case established that eyewitness testimony is not necessary to prove liquor law liability; despite a lack of eyewitnesses, there was enough evidence to show bartenders at Friday’s served the patron alcohol when he was already visibly intoxicated. What Cases Involve Dram Shop Laws? It is important to note that dram shop laws do not only apply to bars. Social hosts can also be held liable for injuries caused by overconsumption at private parties. This includes private holiday parties, office parties, and any other social gathering with alcohol present. Social hosts are not typically responsible for first-party injuries (i.e. a guest drinks too much eggnog and falls down the stairs), but hosts can certainly be found liable for third-party injuries, such as when an intoxicated guest drives home and gets into a car accident. More than 10,000 people were killed in alcohol-related car accidents in 2012, according to the New Jersey Department of Law and Public Safety. Driving under the influence accounts for nearly one-third of total motor vehicle crashes in the U.S., and fatalities from intoxicated driving rose 4.6 percent between 2011 and 2012. And perhaps more troubling, only one arrest is made for every 772 drunk driving incidents. Driving under the influence claimed the lives of 164 New Jersey residents in 2012—18 of them under the age of 21. Liquor liability is treated slightly different when the person in question is under 21. In the state of New Jersey, a minor can sue an establishment for their own injuries sustained while intoxicated. In other words, if a minor is served in a bar, then gets into a car accident, he or she could sue the bar under dram shop laws. One American dies in an alcohol-related car crash every 30 minutes and drunk driving plays a role in over 40 percent of this nation’s traffic deaths. Many opponents of dram shop laws say the statute undercuts personal responsibility for your actions. However, dram shop laws that apply to minors are designed to bolster underage drinking laws; by applying stiff penalties to serving minors, bars and restaurants are likely to be more diligent about checking ID’s and refusing to serve underage patrons. In certain situations, a negligent server can be found liable for assault-related injuries. If he or she serves alcohol to a visibly intoxicated patron, who then drunkenly gets into a fight with another patron, the server could be found liable for the victim’s injuries. If you or a loved one has been injured as a result of negligent alcohol service, it is important to get an experienced attorney involved right away. Dram shop cases can be difficult to prove and litigate, but a skilled liquor law attorney can ensure that negligent staff are held responsible for overserving. 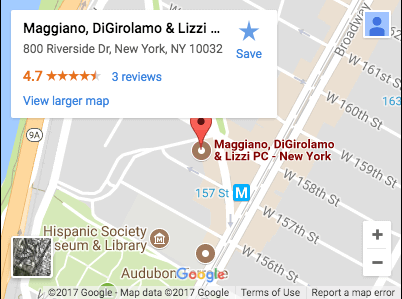 Contact Maggiano, DiGirolamo & Lizzi at (201) 585-9111 or fill out an online inquiry to schedule your consultation. Your initial consultation is always free and confidential, and no fees are due until we win your case.